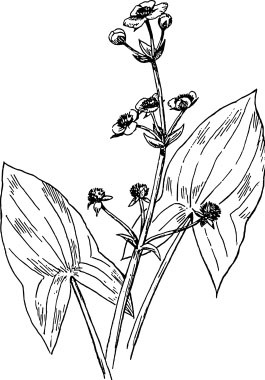 Broadleaf arrowhead, also referred to as the common arrowhead, is a perennial aquatic plant in the Alismataceae (water plantain) family. 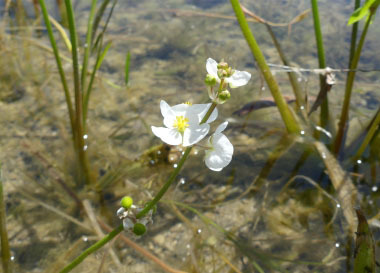 Although this plant occurs naturally in many areas, it is also a sought-after aquatic plant that is cultivated by those who have ponds or waterways on their property. The common names of duck potato and wapato for this plant are in reference to the enlarged rounded starchy golf ball-sized tubers that form at the ends of underground plant runners (rhizomes). When dislodged from the mud, these tubers float to the surface. 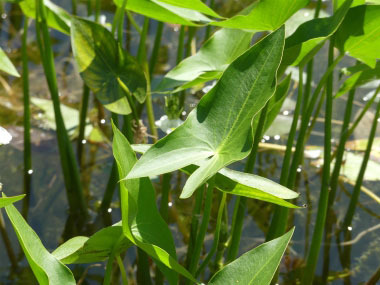 Distinguishing Features: This aquatic plant is quite distinctive with arrowhead-shaped emergent leaves. It blooms mid to late summer with white, 3-petalled showy flowers, usually growing in whorls of three. 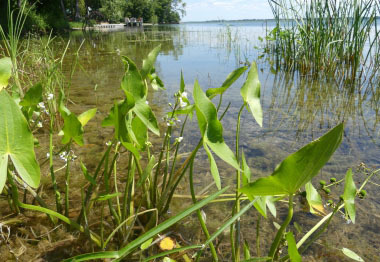 It is an attractive aquatic plant, especially the arrowhead-shaped leaves. 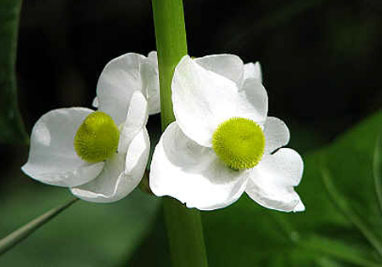 Flowers: This white flower has three rounded petals that appear in whorls of three. The flower scapes are 20 to 50 cm long and topped by 2 to 8 whorls of flowers. The bracts of the inflorescence are blunt or rounded and 5 to10 mm long. 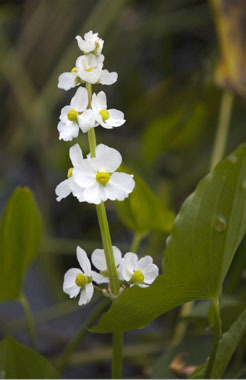 The petal length is 1 to 2 cm. Male flowers have bushy yellow centre stamens (stamens usually number more than 20) and female flowers have mounded green centres. 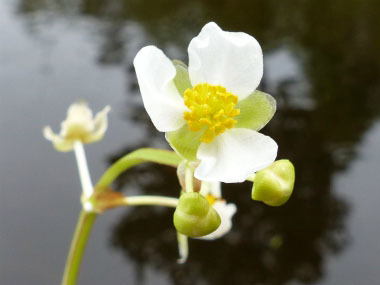 Flowers have small, boat-shaped bracts and the seed pods develop in the autumn. Flowers are in bloom from July into September. Fields of Nutrition has medicinal benefits and vitamin/mineral content of Arrowhead. Leaves: Arrowhead leaves are immersed. The petiole is triangular, erect, and can reach lengths anywhere from 5 to 50 cm. The leaf blade is sagittate (arrowhead in shape), measures up to 30 cm long, and up to 15 cm wide. There is considerable variability in the width of the leaves and length of their basal lobes across different populations. Submerged leaves may be completely bladeless. Height: Common arrowhead can grow up to 125 cm (4') tall depending on location and growing conditions. It does prefer full sun locations. Habitat: Found in shallow water in lakes, ponds, tidal marshes, rivers, streams, and wetland margins. 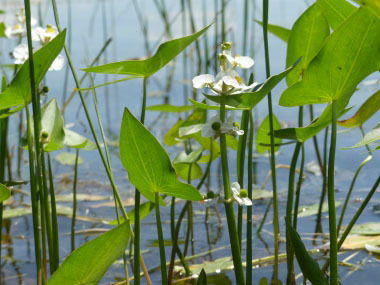 This common aquatic plant is native to, and found throughout Canada, U.S., Columbia, Ecuador, Venezuela, Central America, and Puerto Rico. It was introduced to, and occurs throughout Europe, southeast Asia and in some Oceania locations such as French Polynesia. Edible parts: The tubers of the arrowheads are edible when roasted or boiled. They were important food sources of indigenous peoples and in some areas are still valued as a great food source. Tubers are typically roasted. Though the skin is edible arrowhead tubers are more palatable when peeled. The best time for collecting tubers is in fall or early spring. Tubers are high in starch and phosphorous.